This Christian Shrine is dedicated to Our Lady of The Sea. Located on the crest of a hill facing the Arabian Sea, it attracts tourists of all faiths. 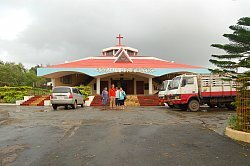 This structure has been built with local donations from the faithful who have had their prayers answered. The main altar and the interiors are very well done - and definitely worth a visit. It has an oratory opposite to it which has a picture perfect background of fishing boats with hectic activity. The Uttan light-house the guides fihermen to safety is very near. 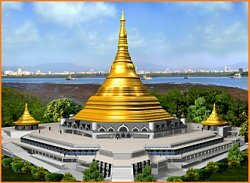 This Buddhist Monument has been designed as a replica of the Shwe Dagon Pagoda of Yangon, Myanmar to show the gratitude of India to Myanmar for preserving the non-sectarian Vipassana Meditation, in its pristine purity, when it was lost in the country of its birth, India. The genuine relics of the Buddha are enshrined here. It is one of the largest stone monuments in Asia. The technique of inter-locking stones is used to construct the monument. This negates the need for any pillars in the construction of the Pagoda. It contains the biggest pillar-less stone dome on earth. It is more than thrice the size of the previously largest stone dome structure - the Gol Gumbaz in Bijapur (90 feet in diameter). At its centre is a huge meditation hall, 280 feet in diameter which has a seating capacity of 8000 people. At 325 feet height, it is almost as tall as a 30 storey building. Approximately 2.5 million tons of stone was used in the construction. 3.87 million man-days were required to complete the monument. It took 11 years to finish. The foundation stone was laid in October 1997 and the construction was completed in November 2008. The construction work progressed without interruption supported selflessly by Vipassana meditators and devotees from around the world. It is expected to exist as a beacon of Peace and Harmony for the next 1000 years and will act as a bridge between different communities, different sects, different countries and different races to make the world a more harmonious and peaceful place. Essel World is the hottest destination for the ones who are all set to have fun. Being the first and largest amusement park of Mumbai, Essel World is a complete entertainment package in itself. It is located on Gorai Island in Borivali (West) area of Bombay. 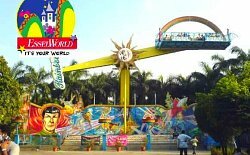 Essel World offers over 40 exciting rides, games, and attractions. In fact, this amusement park is largest theme park in India, with an area of 64 acres. It is the first pleasure ground that introduced Ice Skating in the country. So, plan your trip here to have fun in the sun. Visit any of the above to get a feel of the surrounding areas, each adding an experience that is unique to this locality - enriching your life forever.